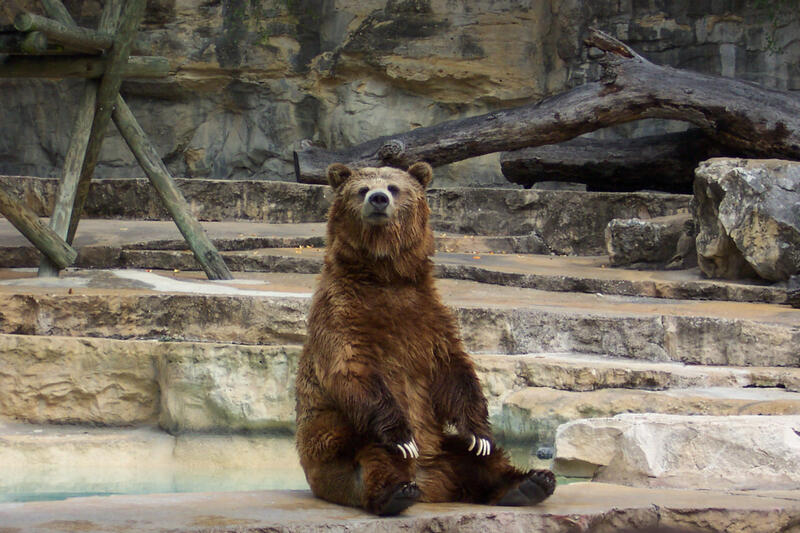 Last week, a jury acquitted Kenneth Herron of a misdemeanor charge stemming from an incident in which he somehow managed to get into the Grizzly Bear Grotto at the San Francisco Zoo. Herron, who has a history of mental illness, ended up within bear-arm's length of two 500-pound grizzlies, one of which walked over and sniffed Herron's foot before police scared it away. Herron was extracted, arrested, and charged with trespassing and "disturbing a dangerous animal." The judge dismissed the trespassing charge before trial, saying there was no evidence Herron had intended to "occupy" the bear grotto. You might have thought that just being in a bear grotto, let alone expending the effort it might take to get into one, would be evidence of "trespassing." The district attorney sure did. "The defendant jumped an electrified wall and a separate fence, jumped 13 feet into a moat, perched himself in the grizzly bears' living area and showed no signs of leaving before zookeepers fired a shotgun and forcibly removed him," said a spokesman. "If that isn't trespassing, I don't know what is." SEC. 5.08. DISTURBING ANIMALS, BIRDS, FISH PROHIBITED, EXCEPTIONS. [I]t shall be unlawful for any person . . . to hunt, chase, shoot, trap, discharge or throw missiles at, molest, disturb, capture, injure, or destroy any animal in any park, . . . provided, however, that any mole or any gopher, mouse, rat or other rodent which is determined by the Superintendent of Parks to be a nuisance may be destroyed by said Superintendent or a designated representative . . . .
First of all, I object to the provision allowing the Superintendent to delegate his rodent-destroying responsibilities. Given the importance of this task, and the severe consequences for the rodent, I think it is bad policy to let a public official delegate this duty to some mercenary. One juror, who did not want his name used, said the panel had extensive discussions over the legal definition of "disturbance." "A lot of people felt that because the bear didn't immediately get up when [Herron] went in, it wasn't 'disturbing' " to the bear, the juror said. Today's Lowering the Bar Free Tip: If you have trouble determining whether a grizzly bear has been "disturbed," stay the hell away from grizzly bears. Kansas Senator: Terrorists Could Infiltrate Fort Leavenworth by … Submarine?